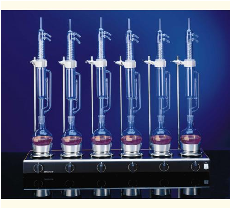 These are ideal heaters for extractors of soxhlet& other types. This apparatus is suitable for heating soxhlet flasks of 50-500 ml and consists of two vertical & one horizontal rod with adapters, mild steel sheet housing & screws to hold the flasks. These work on 220/230 A.C. This equipment enables you to run several projects simultaneously or conduct multiple runs of the same project. It is ideal for extractions, distillations etc. 1. Soxhlet Extraction Unit Consists of mild steel sheet housing, two vertical & two horizontal rods with adopters and screws to hold the flasks. 5. Pharmacy colleges and Industry. 1. Heating element attached to knitted fabric for flask support. 2. Gap between the metal casing and the heater is filled using glass wool. 3. solvent escapes through the draining hole below each element or evaporate in case of spillage. 4. Extraction apparatus is fixed on housing having two retort rods and a cross bar. 5. In-built energy regulator for controlling all the heaters. 6. Heating elements with separate ON/OFF switches for convenience. 7. Pilot lamp for indication of working status.